For those unfamiliar with the base game, a quick overview. Order of Battle, in my mind, plays much like a more tactical rendition of Panzer Corps/General. The mechanics are much the same, combat takes place on a hex-based grid over a series of turns. Click a unit and you will see how far it can move, hover next to an enemy unit and you will see the combat odds. Every unit has an overall "health" number that starts at ten and gets whittled down (or blasted away) over the course of a battle. Units have a dozen or so other stats that effect how it will perform in combat against other unit types. There are numerous historical units available, including different types of tanks, infantry, aircraft, and naval vessels. 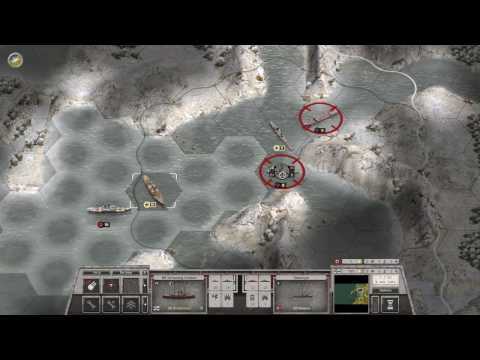 In Kriegsmarine the focus is of course on various types of U-Boats, destroyers, cruisers, and battleships. If you want to see exactly how the game looks in motion, here is a video of me playing through the second scenario. One of the best features of Order of Battle is that you, the player, get to pick and choose most of the units which make up a "core" force that carries forward through the campaign. Other auxiliary units will be available to round out your roster in most scenarios, but this core force will make up the meat of your firepower. These units can gain experience over time, and even be upgraded to better versions as the war progresses. You will be tasked with deciding how to spend a limited amount of resources on purchasing new units, upgrading existing ones, or reinforcing those that inevitably take damage. 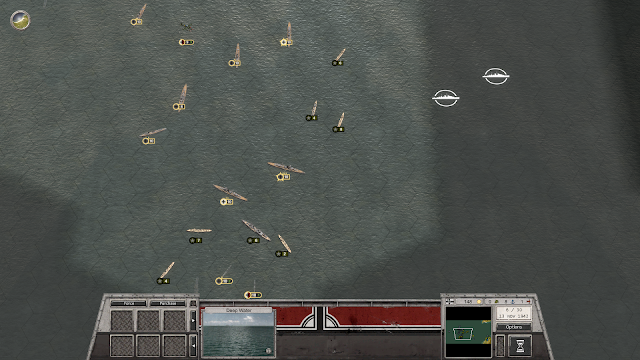 In Kriegsmarine, you will spend most of your points on naval vessels, with a smattering of aircraft to support them. Ground forces are not even available for purchase, only appearing occasionally in certain scenarios. However, there is still a lot of room for decision making. There are various models of destroyers, subs, cruisers, and battleships available. Will you put numerous sneaky subs into the sea, or load up on the big heavies? As you might imagine, a good mix of everything will serve you well. You also have a limited number of slots for aircraft in each mission. I greatly preferred to dedicate these towards reconnaissance aircraft early on, but you can take fighters or bombers if you so choose. A wolf pack prepares to strike. Another way you can shape your force is by choosing specializations, which are permanent perks that you can invest in between missions. The points you have to invest here are very limited, and even if you get extra ones from completing secondary objectives, you won't have enough to get everything. This is a relatively new feature for the series, which was added in the Blitzkrieg campaign and now plays into the other campaigns as well. It adds a nice extra wrinkle to your strategy, letting you improve certain types of units or reinforcing your preferred tactics. In Kriegsmarine, you have a significant choice to make, do you dump almost all of your points into a single line that will unlock a few big and powerful warships, or do you spread those points around on lots of smaller improvements to your existing fleet. So, I've talked about the units that will make up your fleet and how you can customize it, but what sort of missions will you take on with them? The campaign spans nine scenarios, which each task you with a handful of mandatory and optional objectives. Completing the primary objectives is usually pretty straightforward and not that difficult on the default difficulty. However, the secondary objectives give you plenty of interesting challenges to chase after. Each success will earn you some type of reward, be it officers to assign to you ships for stat bonuses, additional specialization points, a free unit, or some kind of advantage in future scenarios. In many scenarios you will be hard pressed to complete all of these extra objectives in one go, but for those seeking some replayability, the challenge is there. Every scenario tasks you with a different sort of goal and circumstance. Direct naval combat is of course the order of the day, but your priorities are ever shifting and sometimes shaped by the geography. In several missions you will be hunting down merchant ships, but the situation will vary. For example, in one mission you are limited to only submarines, while in another you must avoid a powerful Royal Navy fleet while tracking down a few transports at a time. 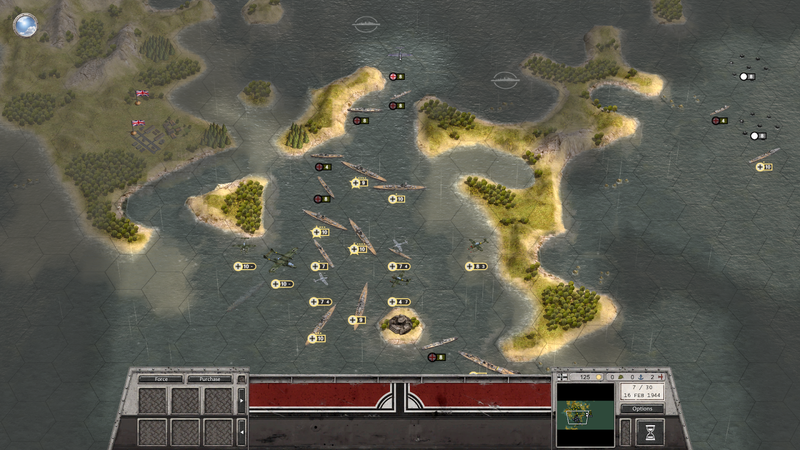 Some early missions have you assisting with amphibious invasions, but the actual fighting on the ground is limited. After these early historically grounded scenarios, and in order for the campaign to cover the entire war while being fun for the player, it quickly goes off the rails in historical terms. The German fleet in Kriegsmarine will not spend the war bottled up. It will win a string of victories and go on the offensive, taking out Allied warships by the dozen. I'll let you play the game and see for yourself, since these later levels tend to be the more elaborate missions. The highest praise I can give to the campaign itself is that I played through the whole thing in a matter of days, without ever losing interest or being bored. It definitely gave me that "just one more turn" feeling more than a few times. There are several changes in mechanics from previous Order of Battle campaigns that were made to create a fuller experience here. Mastering these mechanics is key to keeping your fleet in good shape through the many large scale battles. The tutorial pop-ups explain them well for the most part, but I glossed over some while getting started and had to learn those the hard way. The balance between keeping your ships moving, to avoid being hit, while keeping the range to the enemy fixed, for better accuracy, turns the battles into a sort of a dance of death. The further a ship moves on its turn, the harder it will be to hit on the enemy's turn. Leaving any ship sitting still while enemies are about is nigh on suicidal, and even when you think you are safe, a torpedo armed aircraft or submarine might pop in to deal serious damage. 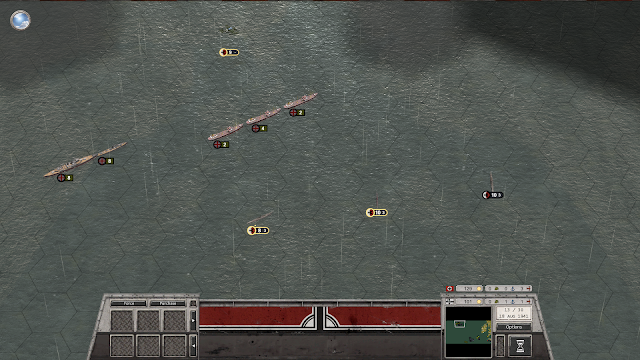 The more cramped conditions of a few battles will have you pulling back your ships just to get some room to maneuver. Other new mechanics include submarines with limited battery time under water before they must recharge, battleships having the ability to fire the "big guns" only on every other turn, and seaplanes, which are more flexible than other aircraft in this environment. Most missions are on the open sea, but some are more cramped. The only negatives I had with this campaign was the balancing of a few unit types. The single battleship I carried through my campaign never felt all that powerful, even after being upgraded and gaining experience. It seemed to be far more vulnerable to torpedoes and drew enemy fire like a magnet. Its special ability was only at times worth using, as it would sometimes do less damage than a regular attack. At the other end of the spectrum, I kept wishing the U-Boats were a bit more deadly, and thought maybe having a bonus to stealthy attacks would give them more bite. As it stands, they are there to pester the enemy at best, being slow, fragile when caught, and having only a mild capacity to deal damage. Even when used in a wolf pack, they could rarely take down an enemy ship before needing to run and hide from sonar equipped destroyers. 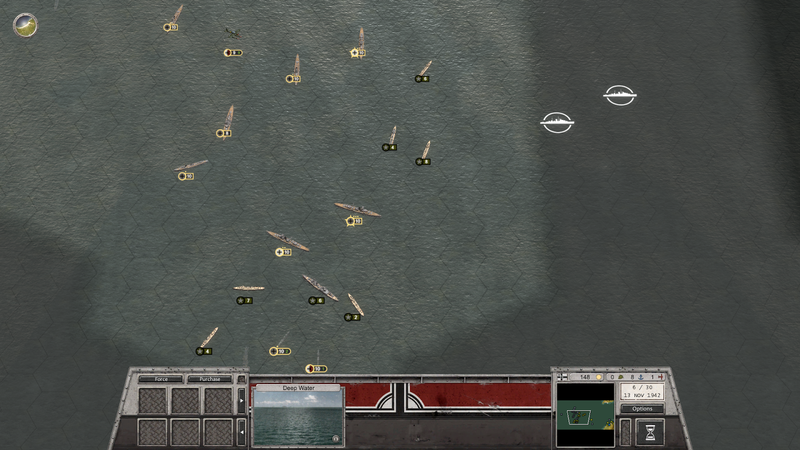 Also, the U-Boats only get one scenario that really puts them in the spotlight. My late game fleet, ready to set sail. Overall, this campaign was much more enjoyable than I initially expected it to be. The naval focused scenarios from the Pacific campaigns in the original Order of Battle were not my favorite part of the game, so I thought it was a pretty bold move for The Artistocrats to make an entire campaign exclusively on naval warfare. That said, I was won over by the improved combat mechanics, the interesting setting, and the solid scenario design. If you don't want to take my word for it, you can actually play the first scenario for free in the Order of Battle: WW2 base game, which includes the original tutorial campaign and the first mission from every DLC campaign. Clocking in at only $10, Kriegsmarine is a fun excursion to a rarely portrayed theater of World War II and will give you some good bang for your buck. 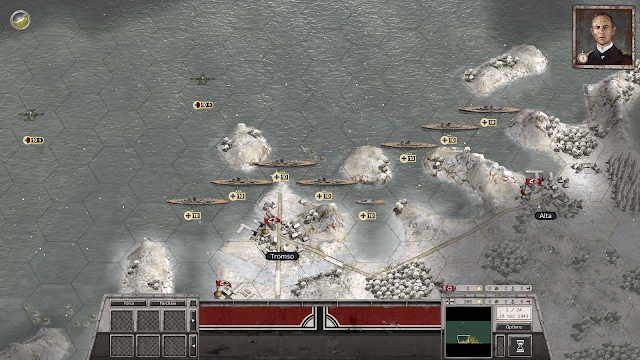 Order of Battle: Kriegsmarine is available directly from Matrix Games here or on Steam.